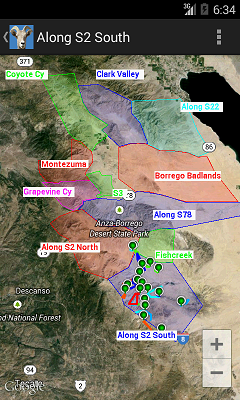 This free Android app lets you hike the Anza-Borrego Desert State park, completely offline, a good thing, as there is hardly any cell coverage in the park. To download go to the play store and search for "anza borrego hiking". 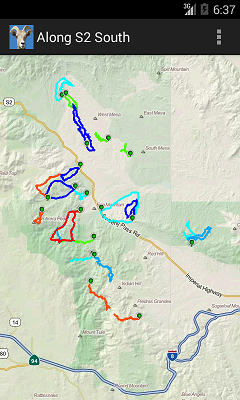 Once you installed the app you can download 4 free Anza Borrego Desert topo / hiking maps and one satellite map. 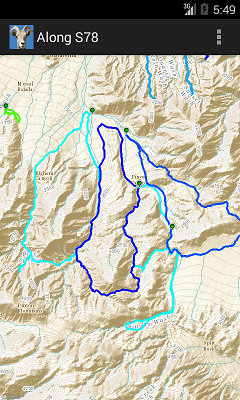 This app allows complete offline use, with pre loaded hikes from BorregoHiking.com. After reading the hiking description you can switch on the GPS location and drive up to the trail head. The App allows you to follow our trails, or record your own, but be aware that some hikes can be challenging. The Anza-Borrego Desert is one of the best places for cross country hiking. It's vast and varied terrain are ideal for day hikes, the hiking times vary from 1 to 8 hours in a brisk pace. The park offers only a couple of real marked hiking trails, most of the hikes don't follow any trail, but follow the washes the terrain or go cross country. By foot, this is perfectly legal in most part of the park, when in doubt check at the visitor center in Borrego Springs. Some hikes are for experienced hikers only and may contain boulders, slippery canyons and other dangerous terrain. Offline map, USGS topo / hiking map. Offline map, Mapquest topo / hiking map. Offline map, 4UMap topo / hiking map. Google Maps Online map, select a region. Keep the region selected for 2 seconds and wait for the hikes to appear. Google Maps Online map, hybrid map. Google Maps Online map, terrain map.